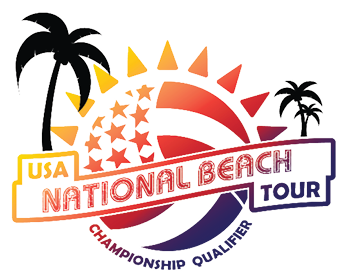 NATIONAL QUALIFIER: The Galvestion Island National Qualifier will be Saturday May 18at East Beach/Apffel Park Galvestion Island TX Sunday June 2 and Saturday July 6 at East Beach/Apffel Park Galvestion Island TX . We have 4 bids in each division for the National Open Division at Junior Beach National Championships. Any USAV member 18 years of age or younger is eligible to play in the BNQ. There are divisions for Boy's and Girls in each of the 8 divisions Boys 18u, 16u, 14u, 12u, Girls 18U, 16U, 14U, 12U. East Beach/Appfel Park: East Beach 1923 Boddeker Drive - Galveston, TX 77550 map it - There is plenty of Free parking at the Boddeker Drive entrance (about 100 yards to the courts) There is a per car parking fee inside the park. You can park right up against the courts (One row only) then have to park N/S in the parking rows. Players/Teams can bring tents (set up inside the volleyball area), umbrellas, coolers. There is restrooms/showers/concessions at the pavilion. We do have 20 permanent courts and room to set up to another 30+ portables. Galveston is APP 45 minutes from Houston Hobby Airport, 70 miles from Houston IAH airport.